Head Voice vs Falsetto: What’s the Difference? The terms head voice and falsetto have been confused singers for a long time. The terms Head Voice and Falsetto make people think that singing is happening outside of their voice. But with the help of modern science, we know that in head voice, the voice is not really coming from the top of the head. And falsetto isn’t false or wrong; it’s actually a very real and useful sound. So let’s talk about the difference between these different vocal registers and more importantly, learn how to use them to sing high notes. Exclusive Bonus: Download our FREE Video with 3 bonus exercises to develop your head voice. Before we start talking about the differences between head voice and falsetto, let’s talk about the two main registers in your voice. There are two main vocal registers in singing: the chest voice and the head voice. 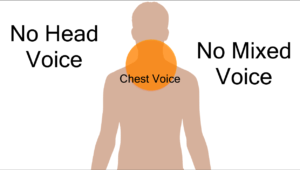 The chest voice is the range of notes at the bottom of your voice. And head voice is the range of notes at the top. The chest voice is created by thick vocal folds. 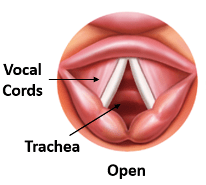 And head voice is created by thin vocal folds. 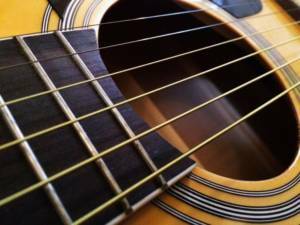 As you start to play higher and higher notes, you have to use thinner strings. The voice works the exact same way. So those low notes at the bottom of your voice are created by thick vocal cords, while the high ones are thinner. Now that you’re familiar with how your voice is split into the two different vocal registers, let’s get into the nitty gritty of head voice vs falsetto. I’m fond of saying that for every voice teacher, there is a different vocal technique. And when we’re talking about how to sing using falsetto, different vocal techniques label things differently. This creates confusion in the student and they begin to mislabel what’s really happening in the voice. The definitions of the falsetto voice and head voice are bound to become a stumbling block for a beginning singer. So here’s all you need to know about the difference between Head Voice and Falsetto. Falsetto is a mode of singing that sounds breathy, flutey and hollow. It’s usually found in the upper registers of male and female singers. We’ve all heard someone sing in falsetto voice at some point in our lives. Some of the time, the breathy quality of falsetto is used for effect to sound otherworldly and beautiful or young. Some of my favorite singers have used falsetto for effect. You can hear falsetto all the time in Pop, Rock and Folk Music. So here are a few examples so you can train your ears to hear the falsetto. Here’s Charlie Puth’s “We Don’t Talk Anymore”. Listen to that breathy falsetto. You can hear through the whole chorus. Or take a look at Maroon 5’s “Sugar”. Again, pretty much the whole chorus is on a falsetto. For a Rock example, take a listen to the Queens of the Stone Age song “I Sat By the Ocean”. Front man Josh Homme goes to that breathy falsetto on the 2nd line of every verse. But falsetto isn’t always used for effect. Sometimes, falsetto is the result of the voice breaking that is completely undesired. We’ve all heard this too. The voice cracks as it is rising and a breathy, cracky sound is all we hear–usually with a drop in volume. But in order to completely understand what causes falsetto, we need to take a look at the vocal folds. When we sing, the vocal folds (or cords) come together to vibrate. This vibration is caused by resistance to the air coming from your lungs. This vibration is rich in harmonic frequencies and creates the raw material of singing. There are 3 modes in which the vocal folds can resist air from the lungs: pressed, breathy and flow. Now each of these modes create a very different sound. 1. Pressed Phonation – Pressed phonation is when there is an excessive amount of resistance to air at the vocal fold level. Since the cords are pushing hard against the air from your lungs, the resulting sound is “pressed” with a bright metallic tone. Pressed Phonation is similar to singing with chest voice. It results in a lot of sound, but can be a strainy if taken too high. 2. Breathy Phonation – Breathy phonation is a mode where there is a lack of resistance to air flow at the vocal folds. Since the vocal cords aren’t pushing to resist the air, breath escapes and the sound is “breathy” with a flute-like tone. Breathy Phonation is similar to singing with falsetto. The breathy, fluty tone doesn’t have the strength of the chest voice. 3. Flow Phonation – Flow phonation is the perfect balance of air and muscle at the vocal folds. The vocal cords are neither pushing nor giving too much so the sound is neither too pressed or breathy. But it’s still strong and resonant. Flow Phonation is similar to singing with a mix of the chest voice and head voice. 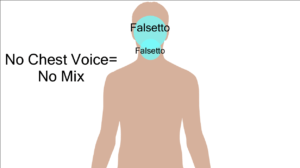 Check out this video explaining the differences between falsetto and head voice. Which Vocal Mode is Falsetto? Falsetto voice is nothing more than a breathy phonation in the head voice register. Basically, falsetto is just a breathy version of head voice. Often when a singer is straining and too pressed in their singing, the muscles in the vocal folds can simply “give up” and disconnect. So rather than having an even, balanced tone at the top, the voice goes from pressed to too breathy. Alternatively, a voice that starts breathy isn’t resisting the air from your lungs well to begin with so they will lose even more resistance in the higher register. So singing too light can also result in falsetto. So, if Falsetto is a breathy head voice, what does singing in full head voice mean? Singing with a full head voice (also called “singing with a mix” or “middle voice) is simply when you sing in your head voice register without going breathy. Put another way, head voice is just a balanced or “flow phonation” at the top part of the voice, or head voice range. This means that Falsetto and Head Voice are simply two different ways of approaching the same note. One breathy (falsetto) and one with a balanced tone (“mix” or head voice). Take a listen to Sam Smith, a master of head voice. Here’s his song “Money on My Mind”. Those high notes that Sam is hitting are not JUST falsetto. There’s a good amount of power in there. Or take a listen to Freddie Mercury sing “Somebody to Love”. All those high notes have so much power! Even Paul McCartney sings in a full head voice. In these examples, you can tell that the singer has chosen a more balanced tone for the top of their voice than the breathy falsetto. It’s not belted like with pure chest voice. But there’s a lot more power than falsetto and no breathiness in the tone! So let’s talk about how to get that sound. As we discussed earlier, falsetto comes from vocal folds that are too thin to resist the air from your lungs. Sometimes, it can be caused by a breathy voice on the bottom. It can also be caused by too much strain and pressure at the cords that results in the vocal folds simply “giving up”. Singing too lightly or heavily are two of the Most Common Vocal Mistakes. In either case falsetto is the result. By the way, if you want to learn to sing through your different vocal registers without just going to falsetto, you can check out my complete singing course, Master Your Voice, here. No matter which situation you find yourself in, we need to find a balanced resistance at the vocal folds. That means finding anything thicker than falsetto on those top notes. So let’s talk about the different ways to hit high notes without falsetto. We know that if your voice is light and breathy on the bottom, then your high notes will be too. The first thing we need to do is get the vocal folds a little bit thicker so they can resist the air from your lungs. In order to find those thick vocal cords with your voice, we need to find your chest voice. If you haven’t heard the term chest voice before, check out this article on How to Hit High Notes. It covers the 3 different modes of hitting high notes and has exercises for each. The chest voice is one of the modes of singing high notes where the vocal folds are thick and stretched. Singing this way is also known as belting. Belting is known for that bright, powerful sound. Before we jump into the exercises, it’s important to know what high notes you can expect from your voice. I’ve written an article on the different voice types and what high notes to expect from each. How Do You Belt Those High Notes? The best way of belting high notes is to sing with more chest voice. I like to help students find their chest voice by using the power of their speaking voice on a scale. Then you can use that power to expand your vocal range. Let’s try the simple Octave Repeat “Nay” exercise. Say “ay” (as in “Ape”) at a strong volume. Do you feel that ugly, buzzy sound on the vowel? Let’s bring that up to some high notes. Take a breath and say the word “Nay” (like “Neighbor”) a few times at a strong volume. Remember to enunciate the ugly “Ay” vowel strongly. Find a comfortable starting pitch (try E3 for guys and C#4 for girls), take a breath and sing the word “Nay” on this pitch, keeping the same strength as your speaking voice. Take a breath and sing the following scale. As you sing the scale, try to make the high note just as strong as the first note. If you don’t have a keyboard or can’t read music, don’t worry. We know that you don’t always break into falsetto if you’re singing too lightly. In fact, you may break into falsetto if you’re singing too loud and strainy as well. Because of the tension and thickness of the vocal cords, they may “give up” and disconnect. So our first step is to unpress the vocal folds and let them thin a bit on those high notes. In order to get the vocal cords to thin, we need to find more head voice. There are lots of ways to allow more head voice into your high notes. But today, let’s use the Octave and a Half “Gee” exercise. The “G” consonant is great at getting the vertical depth of cord needed for chest voice, while the “ee” vowel stretches the cords for head voice. Sing the following scale. As you sing, keep a strong emphasis on the “G” consonant. Again, don’t worry if you don’t have a piano handy. I think it’s important to remember that falsetto is a perfectly legitimate sound. Just because it is associated with voice “breaks” or “cracks” does not mean that falsetto is always bad or must be avoided completely. As we’ve seen, there are many successful artists that use it for effect. However, in the end, we want to make sure we can sing with a “balanced” head voice and “breathy” falsetto on those high notes. It’s important that we are not just defaulting to falsetto because we can’t find head voice. If you feel that you’ve been doing the exercises in this article correctly and are still struggling to find your head voice technique, consider booking a trial free lesson. We will make sure to do some great head voice warm ups so that you can find balance. The free video includes 3 Bonus exercises for developing your falsetto voice. That way, you can improve the top of your range today. Hi, I’m curious, can we belt with the head voice? I mean if it’s complete with a balanced twang, effective vowel modification toward open sounds and strong adductions. I found indeed many rounded belting in the Bb4 D5 range roughly or higher, sometimes to F5 or even G5, sung by men or women with low voices, which resemble very closely the belting of women soul singer with higher voice, or in general the fullness and roundness more typical of women belting. But it’s clear that, rightly so they changed register with respect of what they do with say their E4 and F4 belting zone. They use less vocal mass and that’s good and healthy, but keep the compression. While women with higher voices, of course, likely can get to such notes with their full folded mix. No one is worse or better for that, a higher voice simply sheds mass higher and even for them good results are not granted easily. Also I think that at F5 and above even most female belting is adducted and twanged light mass phonation like men’s (which of course further thins out proportionately). Bottom line is, can you sing very high belts in head voice, without distortion? Thank you very much. From a laryngeal and acoustic perspective, belting is “yelling skillfully” which is not technically a head voice registration. While singers are usually belting in the head voice area, they’re using the larger vocal fold configuration found in chest voice. It’s just that you’re able to thin the folds enough (through twang and vowel) in order to achieve the correct pitch.